After a cooler than normal summer and a very inactive Atlantic hurricane season what can we expect for the upcoming winter across the Washington Region? The latest climate models continue to suggest there is a 60 to 70% probability of a weak El Nino developing late this fall and continuing through the upcoming winter. After researching historical analog years (historical climate data with similar conditions, etc.) I found eight weak El Nino winters and further drilled down to six years that had similar summer conditions (temperatures, inactive Atlantic hurricane season, active Pacific hurricane season and a developing weak El Nino). 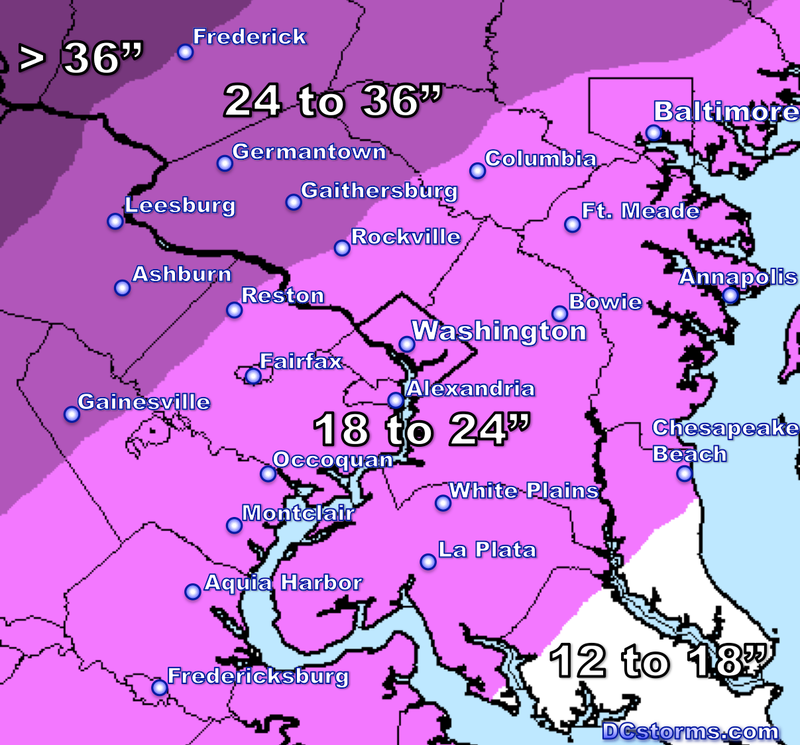 Keep in mind that before you go and buy a snow blower these snowfall predictions are based on an average of the seasonal snowfall that fell during those six analog years. Some analog years featured below average snowfall and others well above average snowfall. 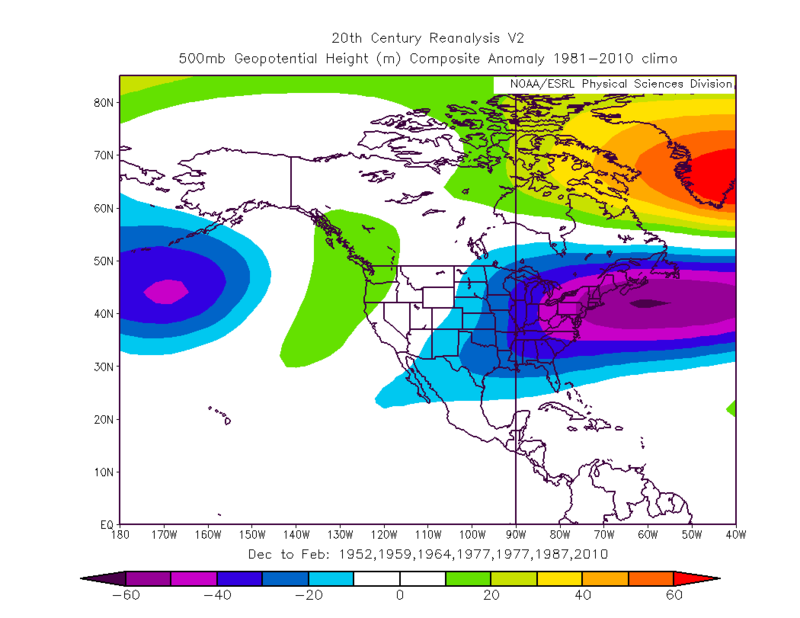 The reason for wide variations in the six analogs has to do with the unpredictable nature of the North Atlantic Oscillation. If the NAO (North Atlantic Oscillation) does indeed remain mostly negative (increased blocking over eastern Canada & Greenland) during the upcoming winter, I would be surprised if the Washington Region didn’t receive at least one Nor’easter with heavy snowfall. 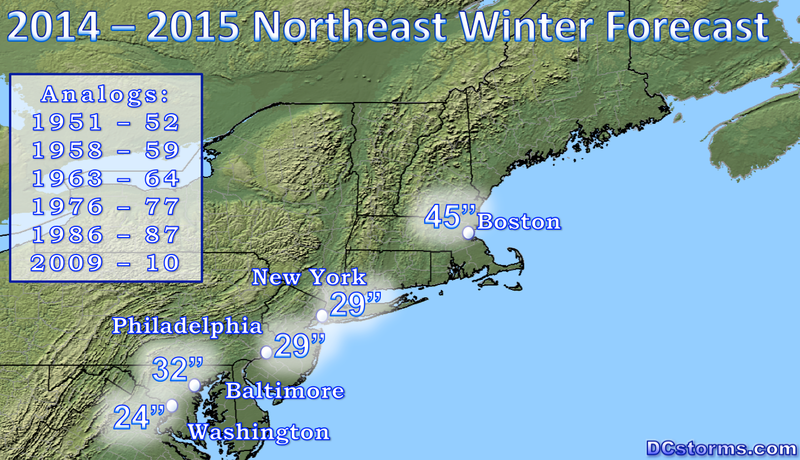 I averaged the snowfall that occurred during the 6 analog years and here is what the big cities received. 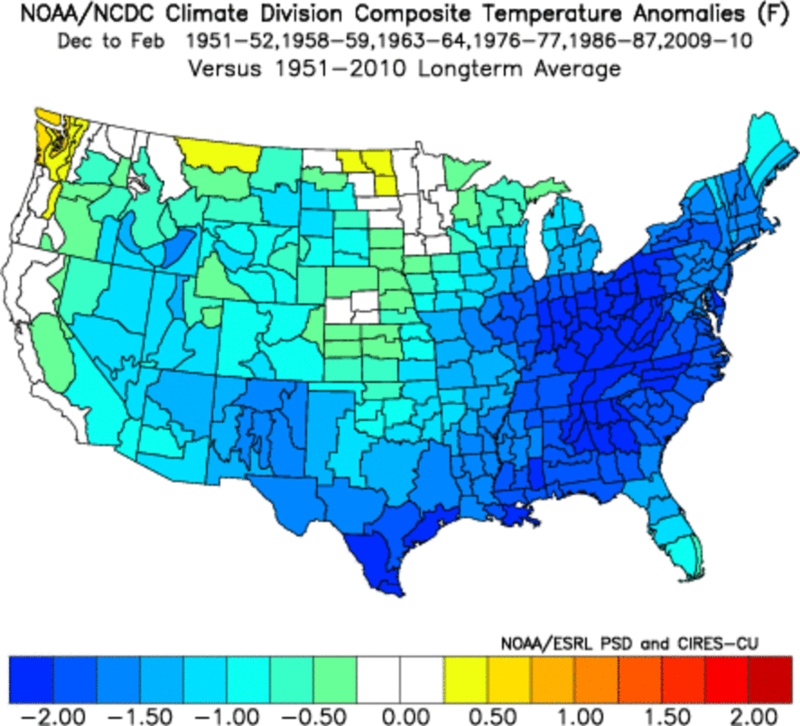 Temperature anomalies associated with the 6 analog years that I chose (image courtesy: NOAA). I expect colder than average temperatures across a large portion of the eastern United States. 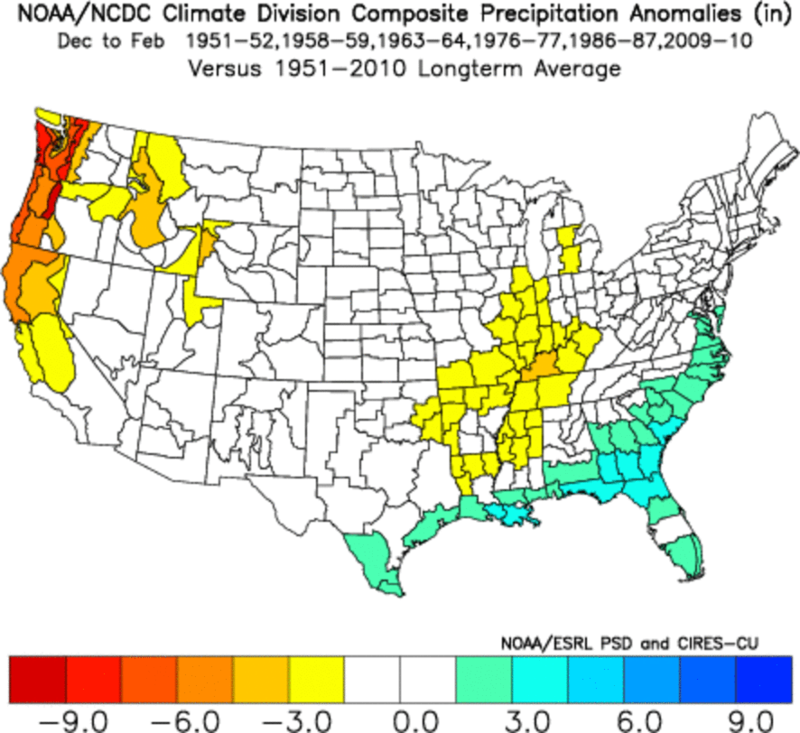 Precipitation anomalies associated with the 6 analog years that I chose (image courtesy: NOAA). I expect near normal to above normal precipitation across the Gulf coast and up the eastern seaboard. A look at the 500 mb (upper level) height anomalies during these years suggests a ridge across the Pacific northwest, a deep trough in the east and massive blocking over Greenland. 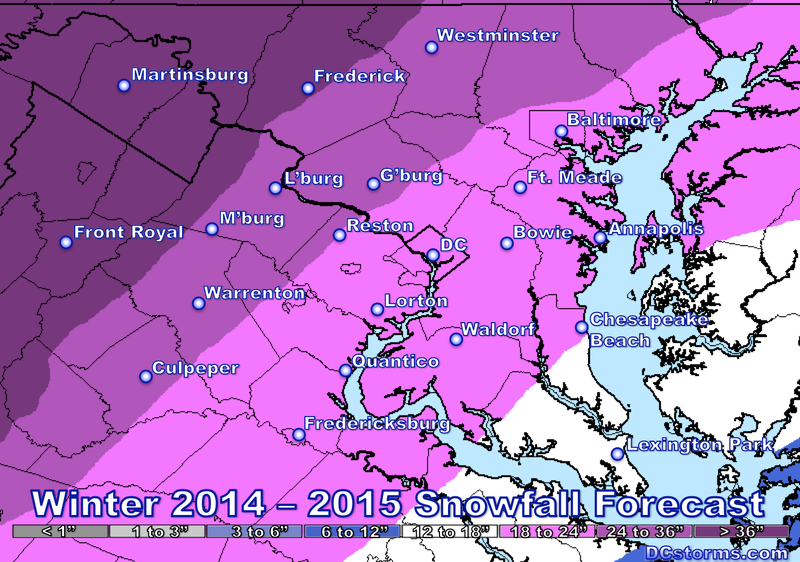 Next Post Heavy Rain Sunday Night… Major Snowstorm on Wednesday? Thanks Tim…. In my humble opinion you’re the most reliable forecaster in the area! I was expecting a bullish forecast based on what little I know and what others are saying and you did not let me down! One aspect that others have talked about is a pool of warm water south of Alaska, which I think is supposed to enhance ridging in western Canada and allow for a better chance of snow vs. rain. Also snow cover in Siberia is quite extensive very early and that is supposed to be bullish as well. 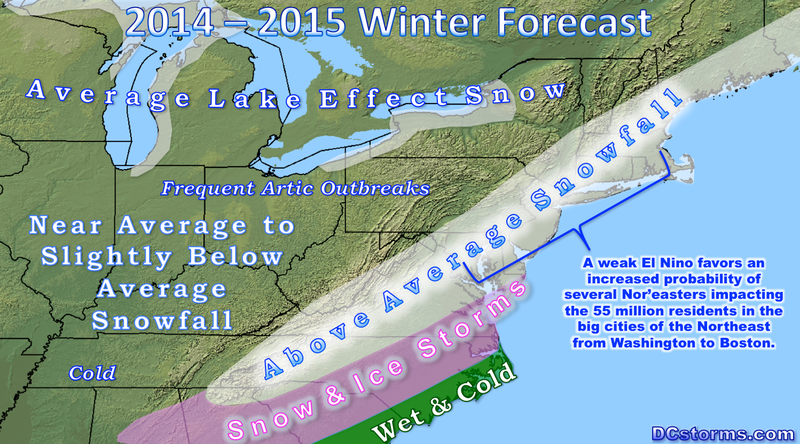 It seems like all signs are pointing to an unusually active winter, much as they did in 2009-10. Of course, luck and timing are very important as well!